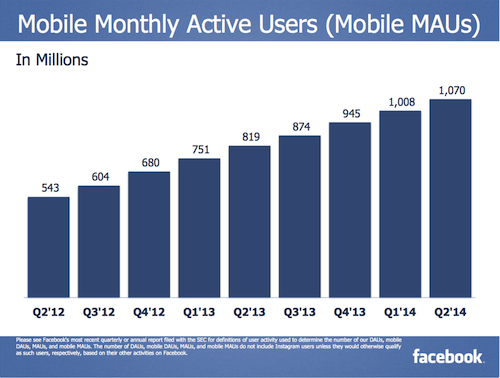 The balance sheet of the second quarter of Facebook is an opportunity to know the latest figures for users. 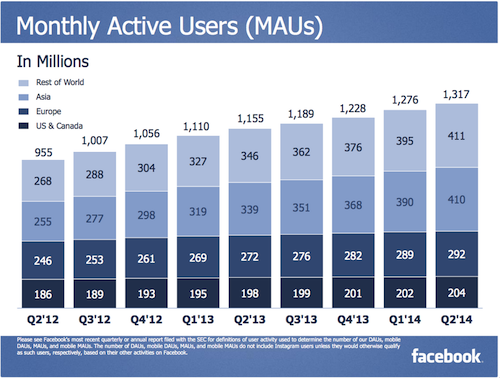 With a total of 1.32 billion monthly active users, the social network continues to attract new subscribers. During the publication the results of the second quarter, Facebook reported that in late June, 1.32 billion monthly active users. This represents an increase over the year by 14% and about 3% compared to the previous quarter. This shows the success of a social network is the frequency of visits and publications of subscribers. To evaluate this, Facebook has indicated that 829 million users are active every day. This trend has increased by 19% over a year and about 3.5% over the quarter. The leading social network does not lose subscribers and even continues to attract new users. The trend is the same and higher among mobile users. Indeed, Facebook gathered in late June, 1.07 billion monthly active users on these supports, up from 31% a year and 6% over the previous quarter. In terms of daily active users, 654 million were browsing on mobile Facebook apps, up 39% compared to the same period in 2013 and approximately 7.5% over the quarter. During the second quarter, Facebook took the same trends progression. Indeed, the group has released a positive balance sheet. It realized a turnover of 2.91 billion, an increase of 61% a year. Net earnings (non GAAP), it has largely increased over the year by 124% to $ 1.09 billion. The proliferation of tools for advertisers explains the revenue growth of Facebook. Thus, advertising totaled 2.68 billion dollars in revenue, an increase of 67%. Focusing on mobile supports, Facebook is right, because mobile advertising accounted for approximately 62% of advertising revenues.